All of the opinions on this book are my own. I am not trying to force a certain thought on people, just expressing how I feel about it. Synopsis (Goodreads): After the grisly murder of his entire family, a toddler wanders into a graveyard where the ghosts and other supernatural residents agree to raise him as one of their own. Nobody Owens, known to his friends as Bod, is a normal boy. He would be completely normal if he didn’t live in a sprawling graveyard, being raised and educated by ghosts, with a solitary guardian who belongs to neither the world of the living nor of the dead. There are dangers and adventures in the graveyard for a boy. 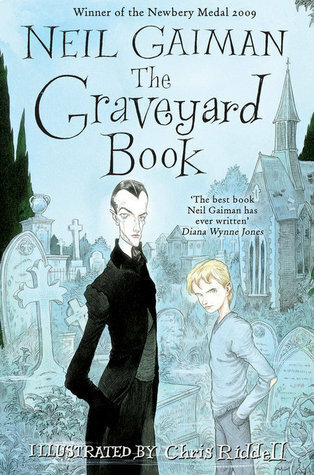 But if Bod leaves the graveyard, then he will come under attack from the man Jack—who has already killed Bod’s family..
My first Neil Gaiman book, and definitely not my last. I highly enjoyed reading about Nobody ‘Bod’ Owens, the graveyard people, and the man Jack. The story was fun, adventurous, exciting. Nobody Owens is a boy who is normal, but has some skills that normal children don’t have. He can talk to ghosts, fade, see in the pitch dark. That gave so much extra to the head character and gave him something to distinguise from the rest of the characters. The amount of different ghosts on the graveyard and their stories was very interesting and entertaining. Allthough I felt like a lot of the ghosts were only introduced briefly, it was working well to keep the light on Nobody and not make it a difficult book to read with so many characters. The amount of different sorts of beings, ghouls, ghosts, witches, Silas (neither alive nor death), was very interesting. The beginning and the end of the book were centered around the reason why Nobody lives on the graveyard in the first place. The man Jack who murdered his family and needs/wants to murder Bod as well. That way the story did end nicely and didn’t have loose ends on that side. It was a nice story about the whole part of Bod his live where he is part of the graveyard. This book would be an amazing script for a movie. The different characters and the concept of a boy living on a graveyard would work really well when made into a movie. I hope to see that one day. I gave this book 4/5 stars.